Welcome Dewey Golden Jubilee Members! now through Monday, Oct. 1, 2018! Use code JUBILEE18 at checkout to receive 15% off your Golden print of any size. Please specify your Golden charity of choice in the comments area. I first met Annie a few weeks after finishing Running Free. The painting of Running Free could be seen on my easel just off the boardwalk when my gallery had been in downtown Bethany and had attracted the eye of Annie's owners. They came in my gallery and the husband wanted to buy Running Free, but as with most really good relationships, he and his wife wanted to discuss the purchase together in private first. In the meantime, another person saw a post featuring Running Free on Facebook and decided he'd love to buy it and asked for first right of refusal until he could get downstate to see it. I'd known him many years and said yes. The same night, Annie's parents called to say they wanted to buy Running Free and I told them I was honor bound to hold it for the other gentleman, but I'd be glad to paint their own dog for them. Anticipation or Annie-ticipation as her parents call the painting, is the result. I'm offering prints of both, at both owners' requests. Interestingly enough, our Golden Retriever lovers who have bought these prints are evenly divided over which of the two dogs painted more closely resembles their Golden, for each has a distinctly different look and personality - both, as most Golden owners would agree, being wonderful! The client who bought Running Free is a rescuer of senior and handicapped Goldens. 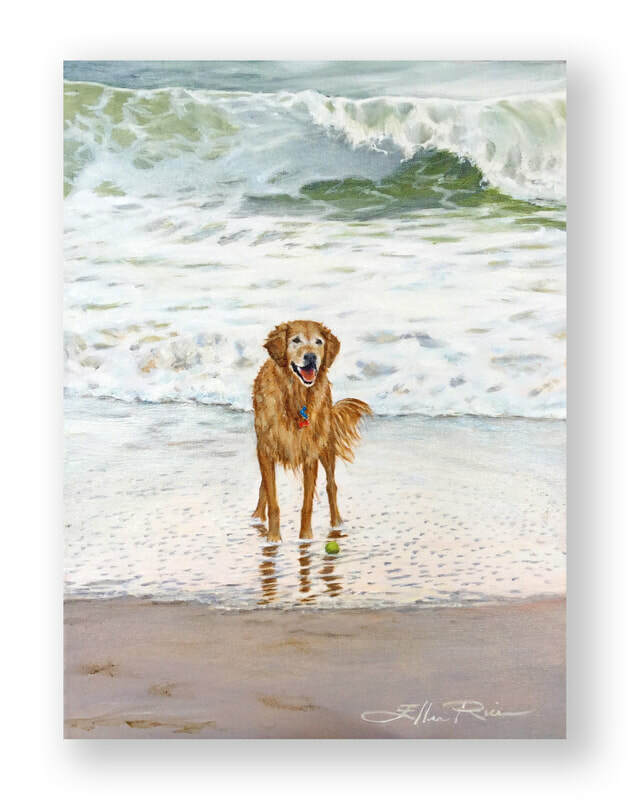 At the time I delivered the painting of this happy, energetic Golden running towards you from the surf, he had seven rescues and I got to meet them all. Different colors, different personalities, all of them sweetly golden. What a great introduction to the breed! I hope you enjoy my two Golden Retriever paintings.